Sophisticated with maximum functionality. Grab your laptop, iPad, tablet, books, files and off you go! The perfect spacious tote for work, school and travel. 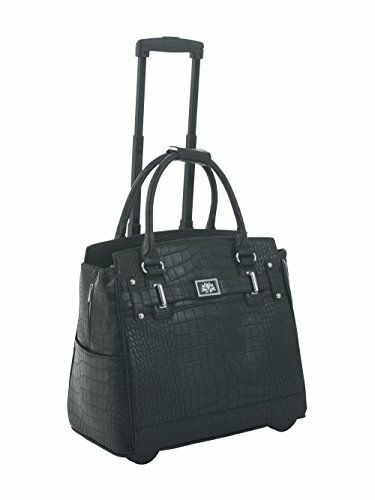 Look stylish wherever you go with this classic black alligator rolling tote carryall bag. ----------------------------------------------------- rolling briefcase, roller briefcase, ladies laptop bag, wheeled briefcase, rolling computer bag, jkm and company, briefcase on wheels, briefcase with wheels, briefcase spinner, rolling laptop case, mobile office, women, women's. --------------- Makes a great nurse gift or graduation gift for any nursing student, law student, teacher, teaching student, graduate, business student, medical student, medical school graduation, social worker, engineer, veterinarian, graduation gifts. Black faux alligator crocodile exterior laptop carryall or rolling briefcase. Silver tone hardware plus an elegant flower medallion. Back side zipper pocket and two exterior side pockets. Removable padded pocket will fit your tablet, iPad, 12", 13", 14", 15, 16" or 17" laptop. ** Laptops are measured corner to corner diagonally. ** The main compartment of the bag will fit up to a 18" inch (45.72cm) laptop (measured corner to corner diagonally). If you place your laptop in the main compartment of the bag, we suggest using a laptop sleeve for added protection. The padded laptop pocket can be easily removed to make a larger interior space. Fully lined black interior with a large zipper wall pocket plus two open pockets. Secure zipper top closure. Side expansion zippers for those days when you have more to carry. Pull out retractable handle & durable inline style wheels for easy mobility. .